Check out our "Updated" Videos page. A video is worth 10,000 words. also contributes to significant heating/cooling energy savings. The garage in the background of this picture, is also dry stacked. Notice the stylish white stucco wall surface of the garage. Your family deserves financial and physical security in their home. Starting today, you can reach that goal for your family. Dry stacked block home construction builds for less by using concrete masonry units (blocks) and a fiber-reinforced Surface Bonding Concrete (SBC) coating. No high tech gimmics here, just tried and proven methods using convential materials. This is the most cost effective yet impervious home building material available. 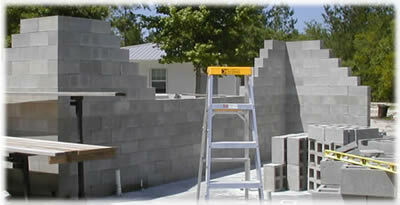 Solid concrete walls work just as well, but concrete walls are not cost effective due to expensive forms requirements. 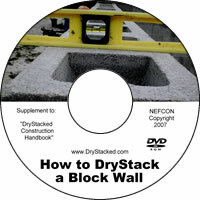 The dry stacked walls are just as strong and much simpler for a home owner builder. Simplicity and strength are the key ingredients to a successful home owner builder. Both conventional homes and passive solar homes are constructed using dry stacked block techniques due to the reasons stated above. This website demonstrates the building of a conventional (non passive solar) home. A passive solar home uses these same drystacked block techniques. http://www.thenaturalhome.com/passivesolar.html, shows the same dry stacked block technique used in building a passive solar home design. Their website can assist you with passive solar issues, and this website can assist you with the details of dry stacked block construction. You will find our website listed at their "Links" page. Conventional concrete blocks are simply stacked, and then locked into place by a coating of SBC that is applied to both the inside and outside of the walls. This eliminates those unsightly grout lines as seen on most block walls and also water proofs the walls. This SBC can be tinted to achieve wall colors other than white or gray. This wall thermal mass reduces heating/cooling expenses by averaging out the daily temperature variations. The outside temperature spikes and plunges are buffered by this block wall mass in conventional homes. Earth bermed and thermal mass homes often use dry stacked wall construction because of its convenience. They also fill every block cell with sand or concrete to improve the thermal mass of the wall. Conventional home design only fills a vertical cell at 8-foot centers and provides less thermal mass, but still provides significantly improved thermal mass over conventional wood stick structures, resulting in lowered heating and cooling costs. Additional wall strength results from a continuous rebar reinforced concrete bond beam, and vertical rebar reinforced concrete filled wall cells on 8-foot centers. Thermal mass homes will fill more of the wall cells. The SBC is typically sprayed on with a low cost SBC sprayer. You can purchase a sprayer or find plans to build your own sprayer here. The sprayed SBC is finish troweled to achieve the desired stucco surface effect. Unlike normal stucco, this SBC is fiber reinforced for added resistance to physical damage. Unlike normal stucco, this SBC is water proof, which eliminates dampness in these draft-free walls. DryStacked walls are impervious to rot, insects, moisture and high wind flying debris. The SBC coating interlocks all the blocks into one integral wall unit by sandwiching the blocks on both sides with the SBC. DryStacked walls with the SBC coating prevent dampness because of the SBC waterproofing properties. Increased hurricane resistance results from roof tie-down straps that are securely embedded into the concrete bond-beam at the top of the walls during home construction. This website information is based upon tried and proven experience, not hype.